I'll admit, trying to be levelheaded about the moves the Mariners have made or not made has been arduous, but needed. At least for me. Losing one's mind every time the Mariners make a move that isn't even a blip on anyone's radar doesn't nobody any good and gets you nothing except a trip to the doctor to check your high blood pressure. It is with this in mind I see the Mariners signed 1B/DH Mike Jacobs to a minor league deal with an invite to spring training. For the first time in a while, I'm sloughing off the levelheaded muck and embracing the frustration. 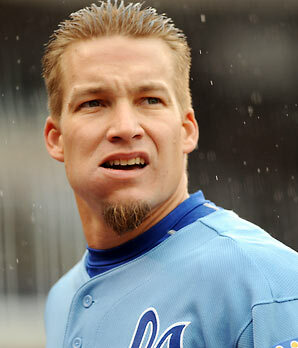 This offseason, the big signings have been Jason Bay, Raul Ibanez, Jeremy Bonderman and now Mike Jacobs. Seriously, we're in 2013 right? I haven't stepped into some sort of hole in the fabric of time and ended up in 2005 or something? All of these players may have been worth a mention in 2005, but not all. Barely worth a mention a few years ago, but why not gather them on to one team and see what we can make out of it. Hey, here's an idea! How about we scrap them for parts instead? I'm sure you've read most of the same things I have. The Mariners are still trying desperately to land a hitter by way of a trade. And yes, I've also read about the rumors about Giancarlo Stanton and the Mariners, but stop it. For the sake of your sanity, don't even go down that road. Would it be amazing to think what he'd mean for the offense? Absolutely. Would it possibly drop the farm system into the bottom 10? I'd bet everything I don't have on it. For Stanton to end up a Mariner, a package would probably have to start with Walker, Hultzen, Franklin and Seager. That's just a start. Realistically, think Erik Bedard/Adam Jones trade but with a better player coming back to the Mariners. Even then, add two of the three top pitchers on to the players leaving the Seattle system and you'd have a pretty good idea of what it would take to get Stanton. I think there's a better chance that all of us get dropped off on an island with a spear and a magazine and we all end up spontaneously breaking out in hives from an ice allergy in the tropics. That mostly makes no sense, which is kind of where I'm going with this. While it would be amazing to get Stanton for a piece of gum and lint I could find in my pocket, that is not going to happen. In case you haven't noticed, I really don't see the point in looking into Jacobs as a baseball player and how it might effect the Mariners in 2013. If he makes the big league club, it'll be because a couple of the current major league regulars were sacrificed in a volcano to get a few more wins the next few seasons and they needed a player who was actually breathing to take the field. He's not going to hit 30 home runs like he did that one time. You remember that? He hit 32 home runs for the Marlins in 2008 at the age of 27. His next highest total was 20 in 2006. Jacobs has played in 20 major league games in 2010 and 2012 combined, hitting one bomb while batting .209. I looked at the numbers, I laughed hysterically and closed the page. That's my analysis of the signing. As Ken Rosenthal and Jon Morosi wrote in this article, the Mariners are getting desperate and Justin Upton is still on their radar. The problem, however, is that the Mariners are one of the 4 teams on Upton's no-trade list. This could be a money thing, where the player can say I'll only accept if you give me an extension or pay me more money, but that generally includes large market teams. If the Mariners are on that type of list, its probably because the guy really just doesn't want to play for that team. That could change if he gets an extension from the Mariners or they offer to give him a kidney for some odd reason, but any road that leads to the Mariners getting Upton in a trade has to go through Upton. I hate saying it, but if a trade falls through with the Diamondbacks for Upton, it may not be Seattle's fault. Let's not kid ourselves though, that's not going to make anybody any happier. A big deal has been made that the Mariners have money to spend this offseason and so far, it's all gone to players that were pretty good a decade ago. This wasn't exactly a strong free agent class, but I don't really feel like being the one to say chill this time. The front office has about a month and a half before players are required to report to spring training. At this point, I really don't care if they sign Michael Bourn for crying out loud. Something other than veteran fluff and fill in pieces needs to end up putting ink to paper before the season starts. The bad taste of failure is starting to get a little too sour, even for me.